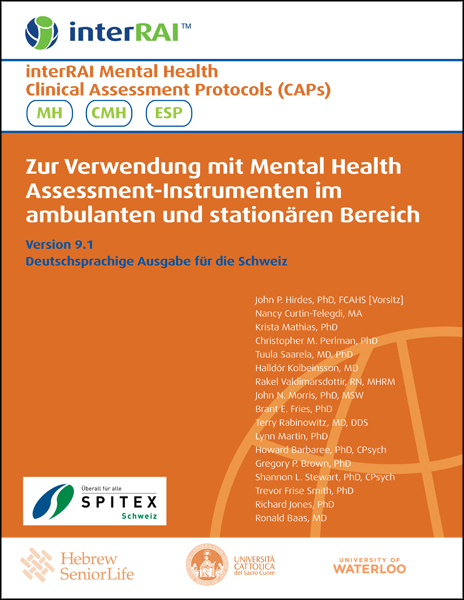 The Swiss German edition of "interRAI Mental Health Clinical Assessment Protocols (CAPs) zur Verwendung mit Mental Health Assessment-Instrumenten im ambulanten und stationaren Bereich" is translated from the English "interRAI Mental Health Clinical Assessment Protocols (CAPs) for use with Community and Hospital-Based Mental Health Assessment Instruments." interRAI Mental Health CAPs are designed to help the assessor interpret systematically all the information recorded with the instruments' assessment forms. CAPs are not intended to automate care planning; rather, they are decision-support tools to inform interactions between clinicians and persons with mental health needs. These new CAPs can also be used with the prior generation of interRAI assessment instruments that are used in in-patient settings (RAI-MH). This set of twenty-one CAPs can be used across the continuum of mental health services, and they replace the previous Mental Health Assessment Protocols (MHAPs) for the RAI-MH. The release of these mental health CAPs follows the 2008 release of the CAPs for home care, community health, and long-term care facilities. This book includes introductory material followed by the CAPs themselves, which are organized into the five broad areas of Safety, Social Life, Economic Issues, Autonomy, and Health Promotion. The appendix provides a summary of interRAI scales and algorithms referred to in the CAPs. The Swiss German Edition has been customized for Switzerland, and the German language used in this publication is native to Switzerland.